It's hard to believe, but one of these two people will be elected our new vice president in less than a month! Here's my little analysis of their debate last night: I thought they both did pretty well. Neither of them blew me away. Palin did better than I thought she would, which I was happy about. The main thing that I disliked about her performance was that she kept saying she's middle class. I'm pretty sure her family hasn't fit into that category for awhile, so to me that was a little misleading. She was once middle class, but is no longer. But that's the economic demographic she's trying to appeal to most, and I think it's probably working. I thought Biden was solid, as he usually is in debates, but that he could have been a little more aggressive. It seemed like he handled Palin too gingerly. This was a seasoned politician debating a much younger newcomer who likes to be known as an "outsider," but still, I think Biden should have gone after her as if she were Mitt Romney, which could have given him a decisive victory, as long as he wasn't mean and unpleasant about it. 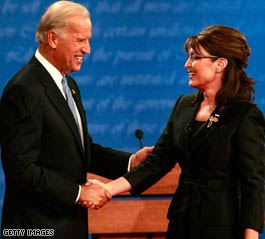 Overall, though, Biden was fine, and Palin held her own quite well, and so I think they both won in different ways. I'd give the edge to Biden, however. In these difficult times I think I'd feel more comfortable with him as the V.P. What the heck, Biden and McCain are the ones with the best experience of the four who are running. Why can't they run together?! What do you think? Did you watch the debate? If so, who do you think won, if anyone? Did this debate make any difference in your decision of whom to vote for?